Málaga Club de Fútbol and Galatasaray Spor Külübu have come to an agreement for Nordin Amrabat (31/03/87, Naarden – Holland) to return to the Martiricos Club on loan, with an option to buy at the end of the season. The Morrocan international will re-join the Blue and Whites following his loan period last season, with the attacking midfielder a key member of the team in the second round of the League competition, playing 15 matches, scoring two goals and five goal assists. 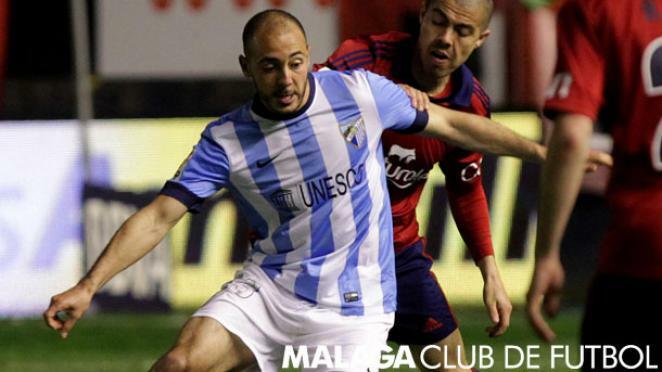 Amrabat will be presented as a Blue and Whites’ player on Monday 1st September at 12 p.m. at La Rosaleda. Fans who would like to welcome the player can access the stadium via door 35 – gifts will be presented in the stands. Nordin Amrabat arrived at Málaga Club de Fútbol in the January transfer window of the 2013/14 season. He made his debut at La Rosaleda on 01/02/14 when Málaga CF played Sevilla FC, which resulted in a 3-2 victory for the Blue and Whites. Amrabat has taken part in a total of 15 official games with Málaga CF, scoring two goals, one in the victory against CA Osasuna at El Sadar (0-2) and another in the win against Granada CF at the Martiricos stadium (4-1). The Dutch player has also helped his teammates with five goal assists. After kicking off his footballing career with his home town team, HSV De Zuidvogels, this opened doors for Amrabat to join the youth ranks of Ajax of Amsterdam. Following a training period, he joined SV Huizen, a modest Dutch side where he had a successful season, which then saw him sign to Second Division side, FC Omniworld. His 36 matches and 14 goals took him to Holland’s First Division, the ‘Eredivisie’, joining VVV Venio in 2007/08. During his first season in Holland’s elite, Amrabat scored 10 goals in 33 games. Amrabat continued to progress as a player, and in 2008/09 he signed to PSV Eindhoven. With the prestigious Dutch team, he played 56 League games and scored nine goals, as well as taking part in the UEFA Champions League and Europa League. He achieved his first title with PSV, the Johan-Cruyff-Schaal Cup (the Super Cup of Holland). In 2010/11, Nordin Amrabat played his last matches with PSV, and during the January transfer window joined Turkish side, Kayserispor, where he played 38 League matches in a season and a half, scoring six goals and 14 assists. In 2012/13, Amrabat joined Galatasaray SK, and was an important part of the team’s League championship win and Turkish Super Cup, playing 33 official games, scoring one goal and seven assists. He also participated in 10 UEFA Champions League matches, offering three goal assists. Before his loan period with Málaga CF in 2013/14, Amrabat played four League games, five UEFA Champions League matches, three Cup games and one Super Cup match, of which his team were proclaimed champions. Although Nordin Amrabat was an international with Holland’s youth ranks, he later decided to represent Morocco, as he is of Moroccan nationality. Amrabat has played for Morocco on 15 occasions and scored one goal.